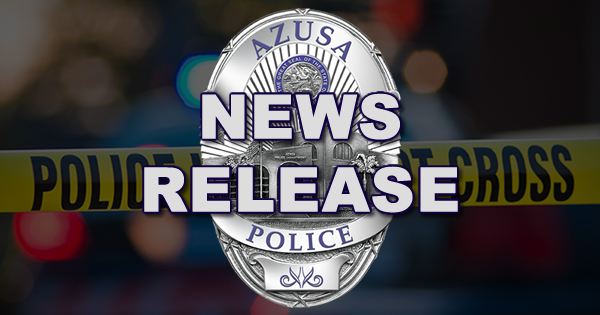 ​On October 5, 2018 at 10:36 PM, an Azusa Police Officer saw two suspicious vehicles driving in the 600 block of N. Alameda Ave., Azusa. Officers attempted a traffic stop on one of the vehicles. However, the vehicle failed to yield and a vehicle pursuit ensued. Shortly after the vehicle pursuit began, a male passenger (identified as Manuel Jimenez, age 26, Azusa) jumped out of the vehicle and fled from the scene on foot. Pursuing officers were quickly able to apprehend him and take him into custody. He was arrested without further incident and will be charged with evading police and weapon-related charges as a firearm was located at the scene. Other officers continued the vehicle pursuit, which led officers on several local freeways and into the cities of South El Monte, El Monte, Irwindale, Glendora and eventually back to Azusa. Early in the pursuit, officers determined the suspect driver was Jose Magdaleno (age 21, Glendora resident). Magdaleno was wanted on a federal arrest warrant and was also considered to be armed and dangerous. He was arrested at Ninth St. and Alameda Ave., in Azusa, after he stopped his vehicle. Magdaleno was arrested for his outstanding warrant, felony evading, and was additionally charged with child endangerment when officers discovered he had two minor children in his vehicle during the vehicle pursuit. A third subject (Lupita Torres, 43 years, Glendora resident) was also arrested for obstructing/delaying peace officers after she interfered with the police pursuit by driving recklessly around pursuing units near the end of the pursuit. She is currently being booked and will be released on a citation. Both Jimenez and Magdaleno are known documented Azusa gang members. The Azusa Police Department is continuing this investigation, which will likely result in additional charges.